The AI battle on our Android phones is getting serious. After Google added Assistant to millions of handsets running Marshmallow and Nougat, Amazon followed by adding Alexa to the Mate 9. And now Microsoft is looking to enhance its new position on the lock screen. Microsoft added Cortana to the Android lock screen earlier this month, but it was little more than a feed of information with news, calendar appointments, and weather. With the latest update, Cortana on the lock screen has been enhanced to allow lock-screen interactions, giving Google Assistant a serious run for its money. The feature, which can be enabled inside the Cortana app, adds a familiar circle to your lock screen that can be swiped to the right to see your Google Now-style series of cards. At the bottom of that screen you’ll also see a new microphone icon. Tap it and it'll take you to a new screen where you’ll be able to ask Cortana questions just like you would in the app. You can now talk to Cortana right on the lock screen of your Android phone. In addition to the new lock screen functionality, Microsoft has also updated the Cortana feed on Android to provide information about your upcoming schedule, commute, and reminders, as well as the ability to quickly add reminders and new calendar items to your day. Lists are also easier to access now so you can quickly manage your tasks. 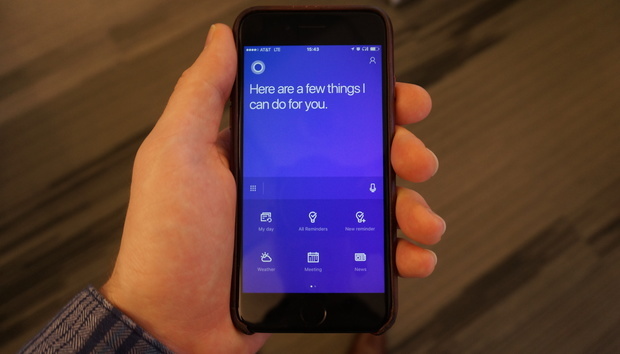 Cortana also plays nicer with Windows 10, syncing your reminders and letting you respond to calls and texts on your PC. The update is rolling out to the Google Play Store, but if you’re not seeing it, you can get it early by side-loading the APK from APKMirror. AI vs. AI: Suddenly our phones are getting very crowded. With Assistant and Cortana both accessible from the lock screen, and now Alexa beginning to cross over to Android, it’s going to be interesting to see how Google can fend off the infiltrators. No AI assistant is perfect, but they all have their strengths, so Google is going to need to keep teaching Assistant new tricks if it wants to keep winning the battle over our phones.